Please give a hand and help remove pesky horehound at an old sheep camp with a view. Give as much time as you like. Horehound is a common perennial weed often found at old stock camps that have nutrient enriched soils. 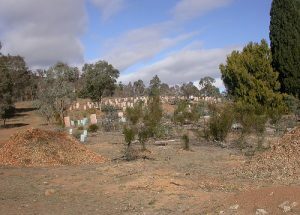 Sheep camp south, approximately 5 ha in area, is one of several stockcamps located on the Mt Majura – Mt Ainslie ridge line. Four years ago, FoMM member Jochen began work to remove weeds (horehound, Saffron and other thistles, Hirschfeldia or Mustard weed, Verbascum, St John’s Wort, Serrated tussock and more). Where: “Sheep camp south” on Mt Majura ridge; click on this map to view the location of the sheep camp (red marker) and access routes (green lines). Meet with FoMM members at 12.30pm at the Mackenzie Street nature park entrance or walk in your own time. Bring & wear: Sun protection, sturdy shoes, drinking water, and gloves if you have them. Enjoy: Great views over Canberra and Majura Valley! Click here for more information, including how to get to the site. Warm up at the FoMM Mulch Marathon at The Fair. Help spread wood chip mulch across bare sites; meet the ANU Intrepid Landcare crew who will be joining in the morning; learn about FoMM methods to improve degraded sites and enjoy hot drinks and cake during the event. Come at any time that suits and give as much time as you like. Mulch suppresses weeds, “conditions” the soil, retains moisture and reduces erosion particularly when combined with layering branches and stems (from woody weed control) over the mulched sites. We will be using the woodchip mulch of local tree and shrub branches that have been cut during recent fire trail maintenance in the Mt Majura nature reserve. A big Thank You to the ACT Fire Unit for delivering the mulch to The Fair site. Where: Nature reserve east of the Fair, North Watson; access and volunteer registration at park entrance Tay / Ian Nicol Streets. Piles of wood chip waiting to be spread at overgrazed and eroding sites (W.Pix). njoy a gentle and informative walk with local ecologist Michael Doherty on National Tree Day, Sunday 8th July. 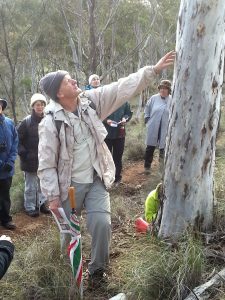 Learn how to identify Mount Majura’s woodland and forest trees, see where they occur and hear how they survive fire and drought. Tree guides will be available for a gold coin donation. Read about The Eucalypts and Wattles (Michael Doherty, August 2012). View some features of eucalypts and other trees in this picture gallery. Where: Nature park entrance, Mackenzie Street nature park entrance roughly opposite Grayson Street Hackett. Wear and bring: Sun protection, appropriate clothing for the weather sturdy shoes and drinking water. Enquiries: EmailClick here for more information. 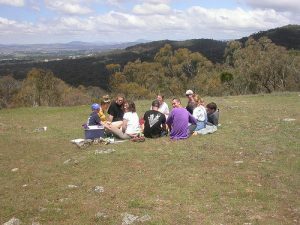 The ACT Woodlands Forum will bring together, scientists, researchers, practitioners and community groups to share knowledge and learnings about woodlands and woodland species in the region. The forum will include invited speakers on a variety of topics and will also include speed talks and poster presentations, aimed at sharing knowledge from new researchers, community based science and outcomes from on-ground projects. This is a free event, however places are limited so registration is required. Register here. A symposium exploring cultural history and natural values of Black Mountain, a nature reserve since 1970, and how to maintain these values into the future. Friday 24 August will comprise a series of themed talks about our knowledge of the past 50 years of Black Mountain and a consideration of its next 50 years. The themes will encompass the natural environment (diversity and ecology of plants, mammals, birds, reptiles, amphibians, invertebrates, and fire ecology) and the cultural environment (colonial and national uses, and a place of protest, recreation, education and scientific endeavour). On Saturday there will be seven guided themed walks to choose from. All walks start at 9:30am. Register here. The Australian Network for Plant Conservation and the Centre for Australian National Biodiversity Research (CANBR) at CSIRO, invite you to attend APCC12 to be held at the CSIRO Discovery Centre with the theme ‘Moving house – a new age for plant translocation and restoration‘. Join us for a week of exciting presentations, local field trips and a 1-day threatened plant translocation workshop! One of our plenary speakers, Dr Jen Silcock from the Threatened Species Recovery Hub, will talk about the 60,000 year history of plant translocations in Australia. Download Jen’s conference abstract here. There will be a night tour to Mulligans Flat Woodland Sanctuary, and a Field Trip to Barrer Hill Woodland Restoration Project with Greening Australia to view a variety of restoration and translocation techniques including the endangered Button Wrinklewort (Rutidosis leptorrhynchoides). There will also be free tours of the Herbarium and the Australian National Botanical Gardens, and you’ll be able to take home free copies of the 2019 ACT Threatened Plants Calendar and the new 3rd Edition of the ANPC’s Translocation Guidelines! Download the APCC12 registration form here. NB.Online registration will be available very soon! And join the ANPC today to receive considerable discounts on your registration fees!